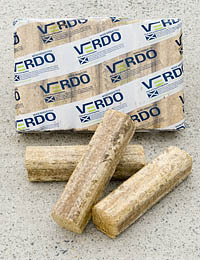 The briquettes are packed in easily managed packs, each containing six briquettes. 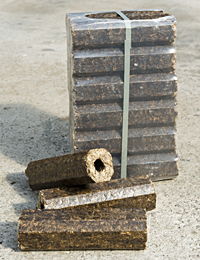 Each individual briquette is 7cm x 7cm x 30cm. As the briquettes are brittle they can easily be broken by hand if required, making them perfect for fitting into smaller stoves. They are easy to use, produce a minimum of ash and are easy to store. As their moisture content is below 10% they result in a greater heat output. Made from 100% natural virgin wood that is sourced in the UK, they are FSC ® certified and contains no additives. As well as conforming to the EN 14961-3:2011 specifications for property class A1 wood briquettes, they are also approved by HETAS as a Quality Assured Woodfuel under the Woodsure+Plus Certification scheme. Bark logs are great for keeping a stove warm overnight or for any other time of the day when a slow burn of your wood fuel is paramount. 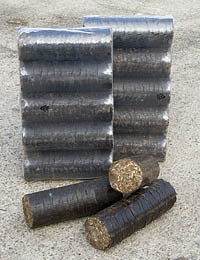 These long lasting briquettes are made from the bark of European conifers. They are round in shape with a diameter of about 90mm. Each log weighs around 2kg. The Bark Logs are ideal for stoves where they can generate heat for up to 10 hours according to customer feedback and manufacturers test results. In order to achieve this, the air vents of the stove should to be closed after the Bark Log has been burning for about 20—30 minutes. These 100% renewable biomass briquettes are made from compressed sawdust and wood shavings, recycled wood and joinery waste. There are no additives or binders used as it is the lignin in the wood and the extreme pressure and heat in production that makes the logs bind together naturally. 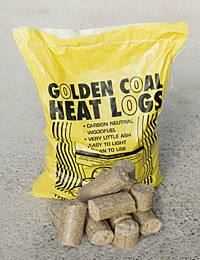 The heat logs are clean to handle and store, and give off a nice golden flame then a golden glow with lots of heat. The briquettes do not spit and spark unlike conventional logs so are much safer to use as a fuel for open fires. Scottish product from Banff.